Dull and Dehydrated skin? Quench your skin’s thirst from within. Lips and eyes can be the first areas of the face to suffer and show signs of ageing when exposed to harsh weather conditions, erratic climates, travelling and pollution. Now the NEW CLARINS Hydra-Essentiel Collection nurtures and revives these two sensitive areas, protecting them from even the most challenging environments. The NEW Hydra-Essentiel Cooling Eye Mask is a super-hydrating formula with a gel-cream texture which makes it fluid and silky smooth to apply. This ultra cooling mask reduces signs of dehydration and fatigue, creating instantly brighter looking, fresh and revived eyes due to the Horse Chestnut ingredient which promotes and boosts radiance. It also contains extract from Organic Leaf of Life, known for its ability to retain moisture even in the harshest of temperature changes. How it works? 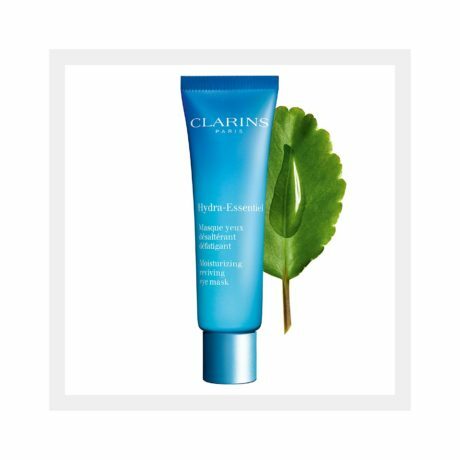 By helping skin to restore ‘various water reservoirs’ naturally and in turn, encouraging perfect hydration for the skin. Finally, Irish Moss soothes taut, dry skin making this super-effective product the perfect combination of technology and plant science. It will relax your eyes and restore brightness and freshness in just 10 minutes! 30ml. at £29, available at Frontlinestyle. 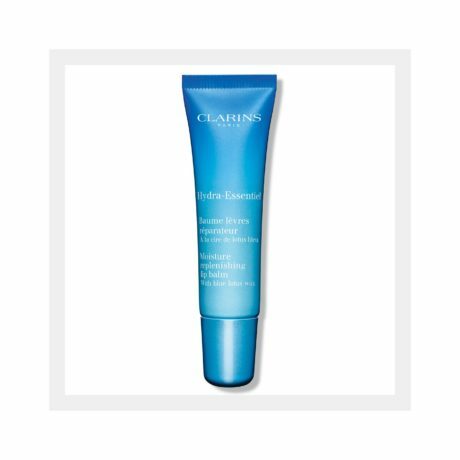 For chapped, dry and rough lips look no further than CLARINS NEW Hydra-Essentiel Lip Balm. Protecting and healing lips which have been exposed to the elements, this lovely lip balm is enriched with Blue Lotus Wax for repairing skin and Organic Cupuassu Butter together with Cocoa Extract to moisturise and soothe this delicate area. The result? Moisturised and repaired lips which have been helped to regain their plumpness, fullness and ‘natural rosy glow,’ making you feel and look fabulous again! For further information about the above products please call us on Telephone: 01749 672225 (Wells salon) and 01225 478478 (Bath salon). Alternatively call into our salons to speak to our friendly and knowledgeable team about the best products for you.